I feel that in life sometimes things don’t go exactly as we’d have liked. A lot of the time it seems the more we stretch to gain, the more we risk to lose. And sometimes you paddle like a spoon, pay the price and have to make the best it! But you don’t want to read about me spooning up my line and losing my boat do you? No. I thought not. 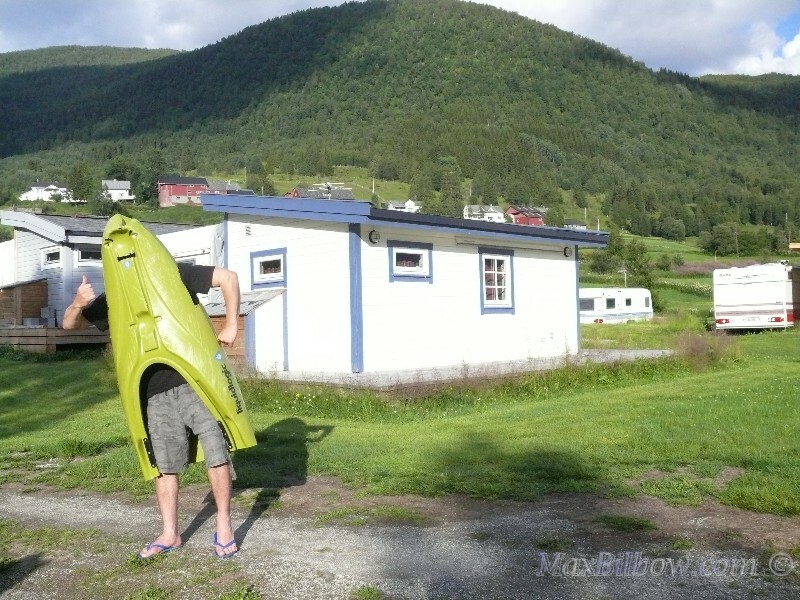 We left Sjoa a few days after our course in search of the sort of gnarly hero-boating that Voss has to offer. 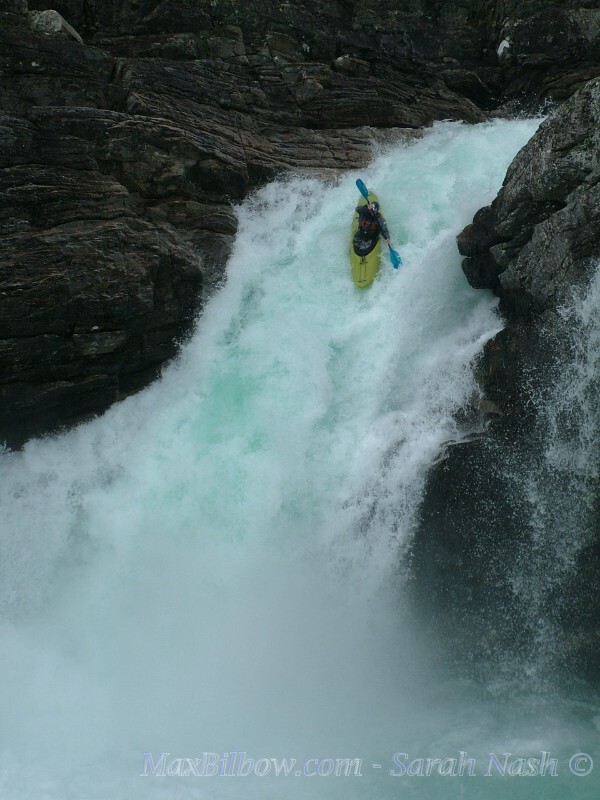 On the way, it seemed rude not to man up and huck the tiple waterfall combo on the Sognadal on route. Tom felt his holiday couldn’t be complete without running the infamous Money Drop. So he did and there’s the proof! I quite like the photo even if it doesn’t fully illustrate the 10 metres of free-fall to follow. 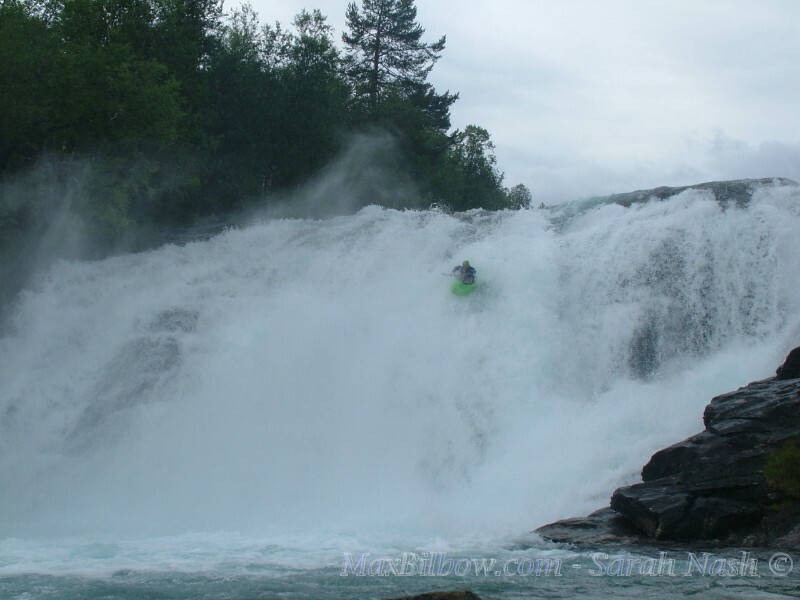 Another classic: Nosebreaker, on the Upper RundalSelvi, is possibly the scariest colossal ‘no-brainer’ I’ve run. 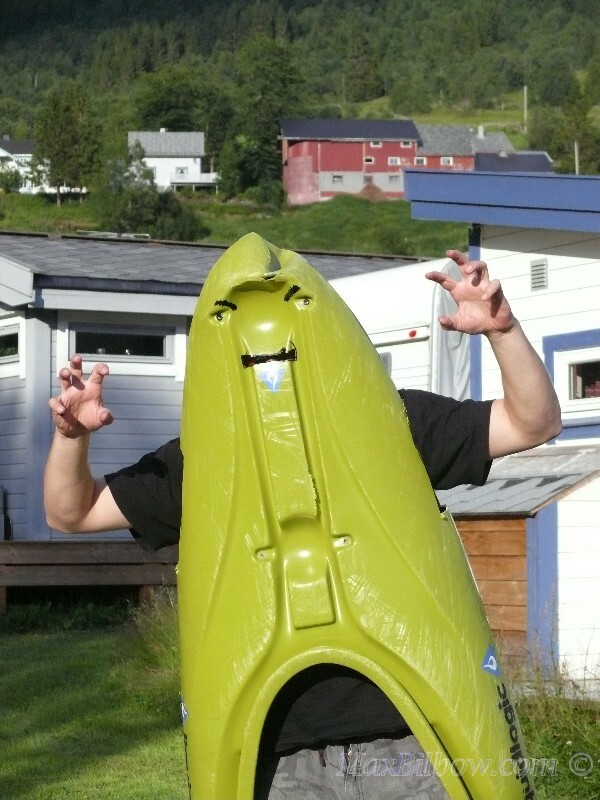 Essentially – going on observations last year – any style of descent will eventually leave you sitting allive and shaken in the pool below… boat sinking or otherwise. However the prospect of up to 10 seconds of downtime in a creekboat due to the enormous force of the water is a scary one. So only one option: stay cool, make the line up onto the curler, point and lift your nose. A few seconds later and I’m sitting upright in my boat and above the water, yahooing and giggling shamelessly, swearing at the river in a less than British fashion. Mint. So what now? I’m physically and mentally drained. We’re all far too exhausted to find any more excitement for the day. Or so I thought until, while staring up at the enormous monstrosity that is Kittle-Breaker falls, Luke turns to me and says “I’m running it“. After noticing a distinct lack of irony in his voice, I headed up into position with the video camera and sat nervously waiting for the boy to demonstrate the integrity of his genitalia. 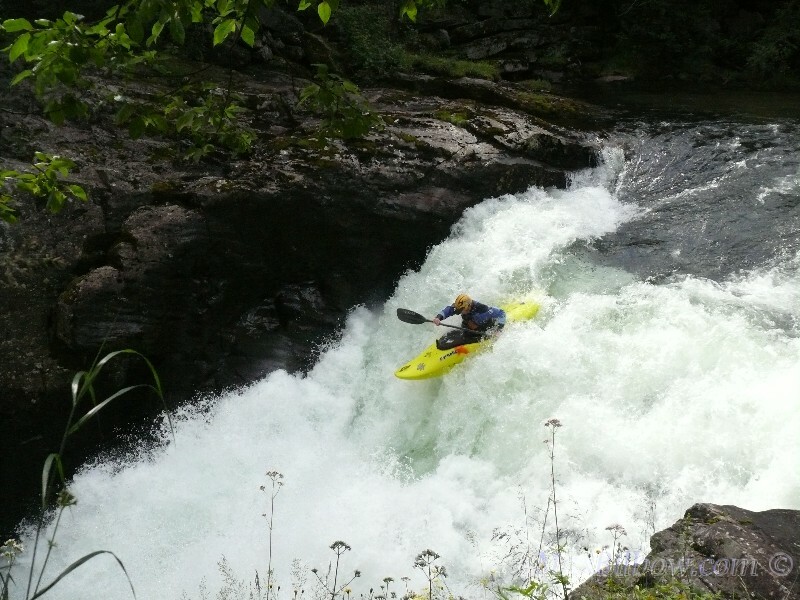 Luke and I had been running the lower Myrkdal 1-2 times a day and, if I’m honest, had gotten a little Blasé about the whole thing. In fact, as class V/VI runs go, it was getting to be rather jolly! 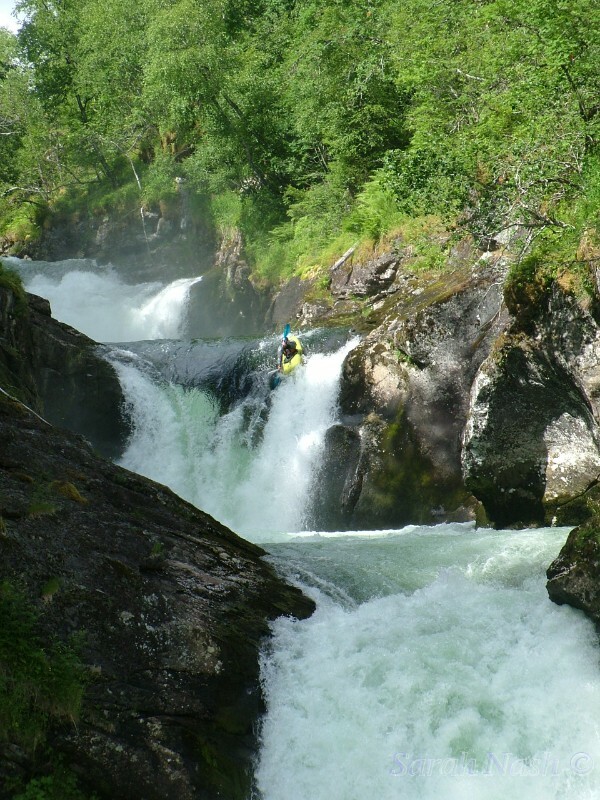 So on our last full day in Norway when the water came up, and Tom woke up early and asked if anyone felt like accompanying him on his first run down the Lower Myrk, I finished my tea and got involved. It was fairly obvious when we reached the slides that the river had a considerably larger flow than previously. However, having shown Tom the path round, I did not feel like taking a hike myself and decided upon a new plan: I would run the first slide and get out below where I would have a fabulous view of the tow-back on the second two… The best lessons are learned through experience and occasional seminars at the school of hard knocks. No worries on the first slide and I’m now stood above the second two – the biggest two – thinking about how hideous the tow-back at the bottom looks. However the eddy on river right is inaccessible due the the harder flows and I’m not feeling the love for mossy rock climbing out on the left. So I’m committed and off to a great start with a smooth line off the second slide, landing with a thud in the pool below. Then there’s no need to stop – I’m straight into the third; a spin half way down for extra style and I’m having a surf in the bottom hole; most fun I’ve had all morning! After some careful consideration I decided to jump ship, floating around for a while before finding some deeper ocean-bound flows to drag myself out of the hole. Tom then clipped me onto his line and we waited for my boat to follow. And waited. After about ten minutes of watching my boat work its way over to the right bank and back again, I impatiently (foolishly) walked up to the hole, ready to jump on it. After another 5 minutes, it seemed more likely that the boat would find its own way out so I began to make my way back to my original location downstream. It was at this exact moment, when I was furthest from the flow, that my boat decided to make a break for it and with one remaining boat on the bank, a high flow and the continuing gnar to follow; a chase was simply not viable. And so – much like that episode of ‘Thomas the Tank Engine’ when Thomas is convinced he can go trundling off without his driver – my boat ran the rest of section, including a 30 metre unnavigable waterfall, alone. But every cloud has a silver lining. I now have a spectacular costume for next year’s National Student Rodeo!